We here at Capitalize My Title love writing so we’ve scoured the Internet to find the best writing tools to make our job easier and more efficient. Below you can find our favorite 12 writing tools that we use almost everyday to create great content for you all. 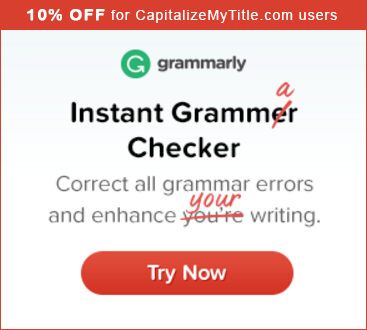 Full disclosure, I am a Grammarly affiliate, but I cannot live without this tool. I use the free Chrome plugin and it is so much better than the built-in Chrome spell-checker. Every time I write a blog article, Grammarly scours my post to find any issues with my spelling or grammar. They even offer plugins for Microsoft Office so you can use the power of the tool from within Windows! I have never paid for the Premium version and enjoy the benefits of the free version all the same. While you can certainly go for a more sophisticated editorial planning tool like CoSchedule, Trello offers amazing planning and organizational capabilities for the price of free. You can create unlimited “Boards” and then create “Lists” with cards for tasks such as content topics. For each of my blogs, I have a list of articles I want to write in a “Backlog” list organized by priority. Then I have a list for “Approved” articles that I want to work on next followed by a “Doing” list where I have the card for the article I’m currently writing. Fiannly I have “Waiting to Publish” and “Done” lists for articles scheduled to be published or published. We love Evernote for taking quick notes on-the-go. They even have a nifty app called Scannable which quickly scans documents that can be saved as PDFs/images or imported right into Evernote for organization purposes. If you’re a student, you can get Evernote Premium for 50% off, but the free version has plenty to offer. You can have as many notebooks as you want in Evernote, but you’re limited to uploading 60MB of content per month with the free version. You can take plenty of notes with this limit, but you won’t be able to upload as many photos or documents. Ok, we may be a bit biased, but even we love our title capitalization tool. We use it and the WordPress plugin all the time when we’re publishing here. Use it to properly capitalize your titles with correct title capitalization rules. Confused about what makes a great title, whether for a book or blog post? 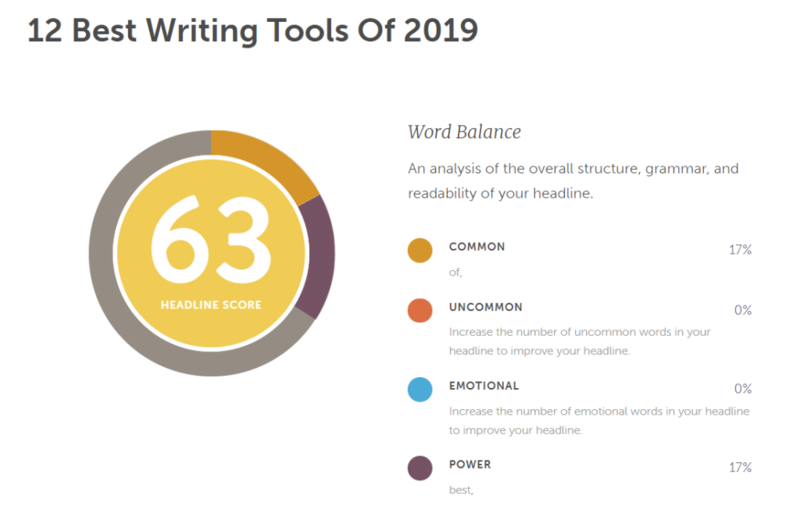 CoSchedule’s Headline Analyzer is a free headline analyzer that will give your title a score from 0-100. Great way to see how your title will perform and perfect it before publishing. This article title actually got a 63 so it could definitely be improved. If you have trouble staying focused, give Tomato Timer a try. It is a timer based on the Pomodoro method which says that you should focus heads down for 20-25 minutes and then take a short break. Research says that if you know a break is coming, you’ll be more likely to stay focused in the shorter working window. While most grammar and spell checkers critique individual words or phrases, Hemingway will focus on the bigger picture of your writing. Hemingway will give you feedback on whether sentences are hard to read and some general stats about your writing, such as how many adverbs you used, but it won’t give you much else. You are on your own to make the corrections it suggests. There are a lot of websites out there now that play ambient sounds. Rainy Mood and Hipster Sound are two of our favorites that play rain and cafe sounds respectively. Personally, I prefer sitting in an actual cafe to listening to these websites, but these tools make a great option when I’m stuck at home for a day. If you need a bit of inspiration or are feeling stuck with writer’s block, then watch these ten Ted talks. If you don’t feel inspired after watching them, then maybe try generating some new blog title ideas. Draft is a distraction-free writing app that lets you quickly write documents without any confusing features. Great tool when you don’t feel like writing in Microsoft Word or Google Docs anymore. BuzzSumo is a great tool for content marketers in particular because it shows you the top trending topics on the Internet and allows you to easily connect with Influencers. It’s a great writing tool for digital marketers who aren’t quite sure what to write about but want to create content that people will find interesting. When paired with a blog title generator, BuzzSumo can be quite powerful. Cliche Finder: In his six rules for writing, George Orwell suggested that one should “never use a metaphor, simile, or other figures of speech which you are used to seeing in print.” The Cliche Finder highlights cliches in your text so you can avoid overused expressions in your writing. The Cliche Finder tool will read your text and notify you of any cliches. Readable: Make sure your writing is readable by humans. Just run your articles or other documents through this website and you’ll get a readability score. The Most Dangerous Writing App: This is a really interesting concept where you set a timer for writing and if you stop writing for even three seconds, the tool deletes everything you’ve written. Sadistic, but creative. Previous articleWhat Is a Proper Noun?